What are your biggest operational worries? If your first thought was “equipment failure,” you’re not alone. Equipment is at the heart of business operations and failure can not only affect essential processes and lead to downtime but also endanger people and equipment. A well planned electrical distribution equipment maintenance strategy is a key pillar of your asset management strategy that goes a long way in mitigating the risk of equipment failure. 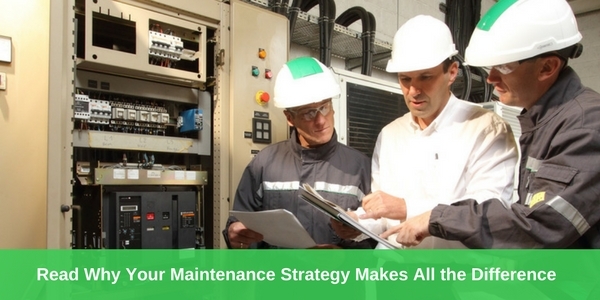 The results of an effective maintenance strategy are far reaching for operations. Improving maintenance isn’t just about saving money. It also improves safety, ensures service continuity to minimize downtime, enhances energy efficiency, optimizes the performance of aging assets to extend their useful service life at optimal costs, and boosts utility asset management efficiency. One of the most important steps when designing a maintenance program is to determine asset criticality, value, service capabilities, plant expected lifespan, and budget because, of course, not all equipment is equally important to your business and not all requires the same degree of maintenance. For example, the failure of non-critical assets may not create safety risks or hinder operations so taking a run-to-failure approach may be the most practical. But in other cases, such as when equipment is crucial for operations, safety, or uptime, the goal of maintenance is to enhance reliability, and that requires a more involved plan. Condition-based maintenance is a diagnostic-based, preventative strategy that keeps equipment in optimum condition. This approach utilizes features of preventative maintenance, such as regular inspections, equipment maintenance, and part replacement in power distribution equipment that ensure reliable and safe performance, but builds upon this idea with the very important addition of testing and analytics and/or continuous monitoring. Using advanced diagnostic services, whether on-site (scheduled or on-demand) or continuous, gives a complete view of the physical state of equipment and how it’s operating. The results allow for early risk detection that can prevent equipment failure by identifying weakened assets or malfunctions, allowing operators to proactively repair or replace equipment before it leads to downtime. The diagnostics also drive decisions like spare parts management and maintenance schedules and save costs by promoting energy efficiency. Diagnostics’ role in a maintenance strategy continues to grow with the addition of more advanced predictive asset analytics, sophisticated IT platforms, and other technology, which increase and improve real-time insights into performance and equipment conditions. Intelligent, diagnostic-based maintenance is changing asset management by giving companies the power to prevent downtime through more informed decision making and better visibility into maintenance, while saving money, protecting assets, and increasing business sustainability.